Quite a lot I would say. Thankfully when they decided against Backrub as it was initially called, the Google founders choose well. Since then, they have flirted with all sorts of naming conventions for Google products, but I do not regard yesterday's choice of Google Drive as the zenith of product naming inspiration. Take Dropbox for example, it does what it says on the tin. The analogy works for most people. Even for non english speakers. And that is where my beef of contention is with Drive. It reeks of geek. Yes I know we all have a C: Drive and assorted other alphabetical ones but even my non geek english speaking friends cannot relate to a Drive. When Google launched Wave, some argued it was a peculiar name to give it although the product was so ahead of it's time and regular users that it defied easy definition anyhow. But Drive? I mean even Microsoft have used Sky as in SkyDrive in some way making that, heaven forbid, fashionable association with the Cloud. Why not Disk Google? Surely even that name is more universal than Drive, or would it infer a too much of a physical item or be a remanant of CD Discs or even floppy disks from yesteryear? So Folder is not a contender because that way of thinking is the anti-thesis of search and carries far too much MSOffice connotations. The people at the Plex have done everything to distance themselves from the Folders ways of thinking in the hope users would follow suite. Remember it's dubbed collections in Docs. Everyone wants space, more space and space is far more multilingual than Drive. Was space given the elbow because of fear of association with MySpace? And while we are on the subject of design, please don't get me started on the logo. 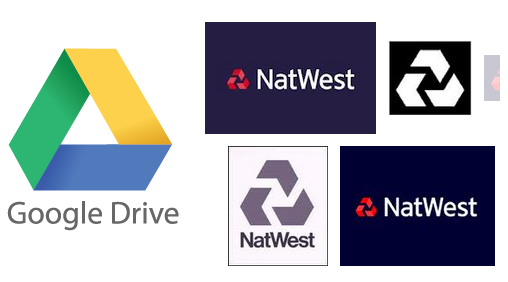 For the brits among us, Google Drive has the logo left overs of a famous high street british bank. You see my mum, that acid test of computing, well she is spanish and even Maria Josefa Alburquerque Lorencio, Fifina to you and me, cannot emote with Drive. I talk with her about stuff, places, spaces, boxes, folders, and hey even computers and stuff I do on the internet to make money for a living. Mostly in spanish, and not just limited to that simple vocabularly. You get my gist. Directories I try to avoid and Drive I reserve only when referring to the Renault or the Fiat on the parked on the driveway. Here's one Google Drive however I do want and could readily emote with. Lastly, if like me you have tried your level best to emote with Drive and have been greeted by such a cryptic message like so, then there's a Google Group for that - which of course you are welcome to join. With your Google Account of course.